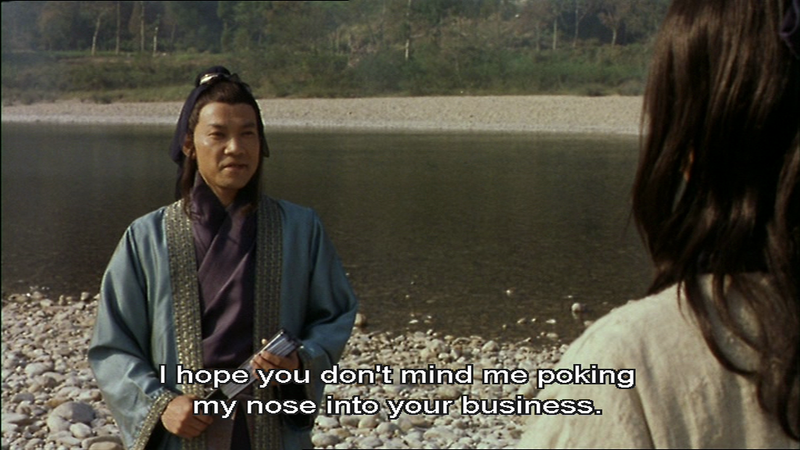 I know very little about Korean films and only a fraction more about the Wuxia genre in Chinese cinema. 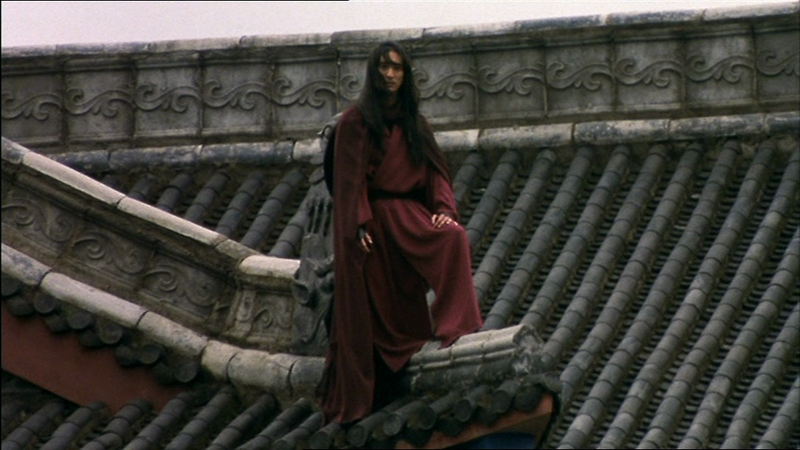 Even then, my knowledge is based on films such as Crouching Tiger Hidden Dragon and Hero which are aimed more at the Western market and probably not representative of the genre at all. But Bichunmoo was one of the first wire-work martial arts films I saw and it’s a little more unusual in that it is Korean. I love it so much because in many ways it reminds me of a cheesy masala film. It has all the necessary ingredients – tragic lovers, excellent sword fights, a hero who refuses to die despite some very convincing attempts on his life, a significant necklace, an evil warlord and even a dance number! Bichunmoo is based on a comic series which ran to six volumes, and that is a lot of story to fit into 2 hours. Nevertheless, director Young-jun Kim includes as much as he can with the result that the film is at times hard to follow and almost every scene contains important plot points. Blink and it’s easy to get lost. To add to the confusion, the film was originally longer but a number of scenes were cut to make it fit into the two hour slot demanded by Korean cinemas. This means that there are characters that suddenly appear with no explanation of who they are. The film also jumps forward ten years and it’s hard to realise this has happened as the characters don’t age, and the advance in time is never mentioned. However despite these flaws there is plenty to enjoy and it’s certainly never dull. 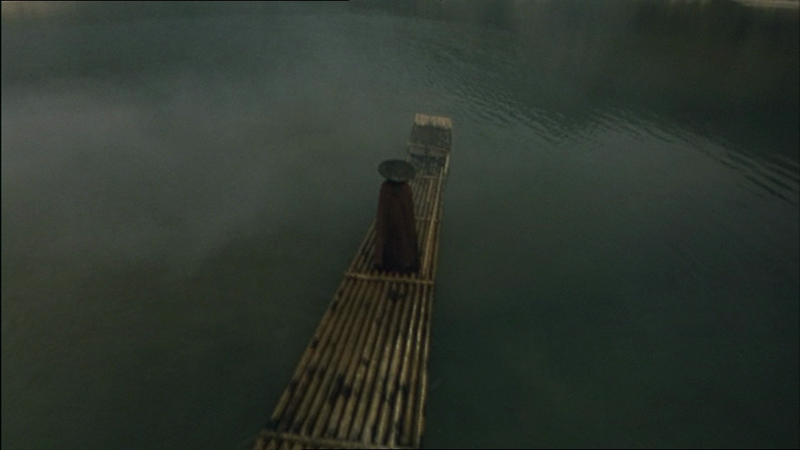 The film opens with Jin-ha (Hyeon-jun Shin) drifting down a river towards an army encampment. 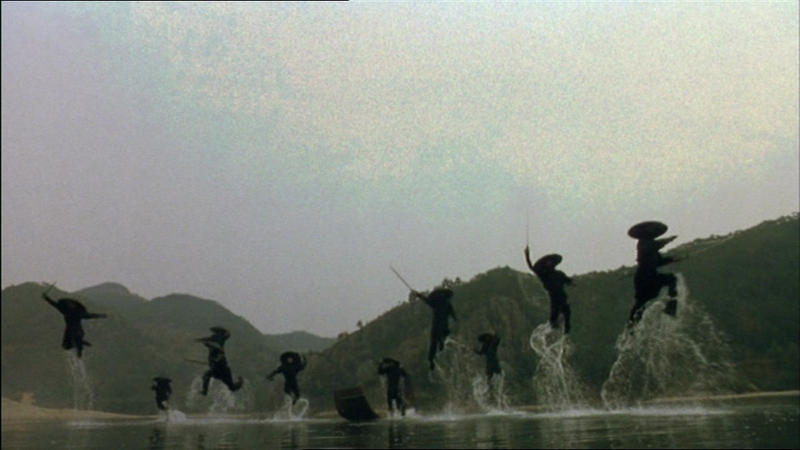 This gentle beginning doesn’t last long though as’ Ten Black Swordsmen’ explode out of the water and make quick work of the opposing Mongolian soldiers in the first of many excellently choreographed fight scenes. The next scene cuts to Jin-ha rather morosely sitting on a rooftop gazing forlornly at his lost love Sullie (Hee-seon Kim) and then quickly moves on to a flashback of their lives together as children. Jin-ha grows up under the tutelage of his uncle Kwakjung (Ju-bong Gi) and learns from the Bi Chun Shi Gi Sword Fighting Book – doesn’t every master swordsman have to start somewhere? 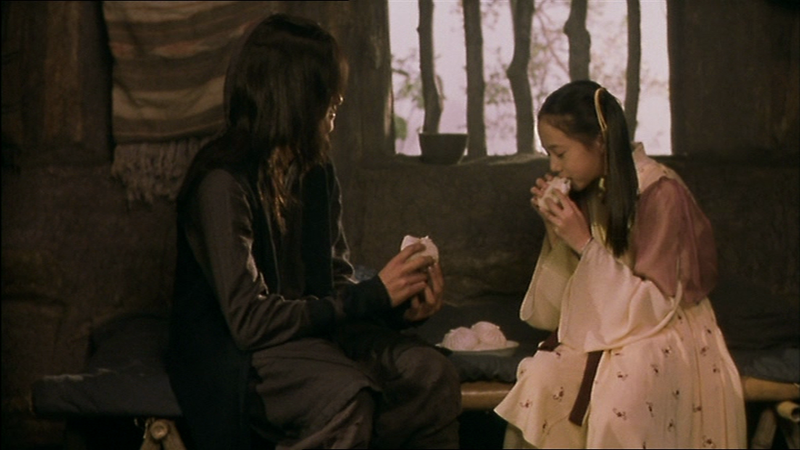 Sullie is the daughter of a Mongolian general and his concubine, but when her mother dies General Taruga (Hak-cheol Kim) takes Sullie to the city. Before leaving she gives Jin-ha one half of a jade necklace and arranges for them to meet in the city proving that no matter how fragile she looks, Sullie is one tough customer and not easily pushed around. Jin-ha’s uncle is killed by assassins trying to steal the secrets of Bi Chun Shi Gi but before he dies he reveals that Jin-ha is in fact the son of a Korean nobleman Lord Yu, and asks his student to take revenge on his parents’ killers. Who just happen to be the General Taruga and his men. This takes us about 10 minutes into the story and already we have separated lovers, a desperate heroine, vengeful hero and an angry father – phew! 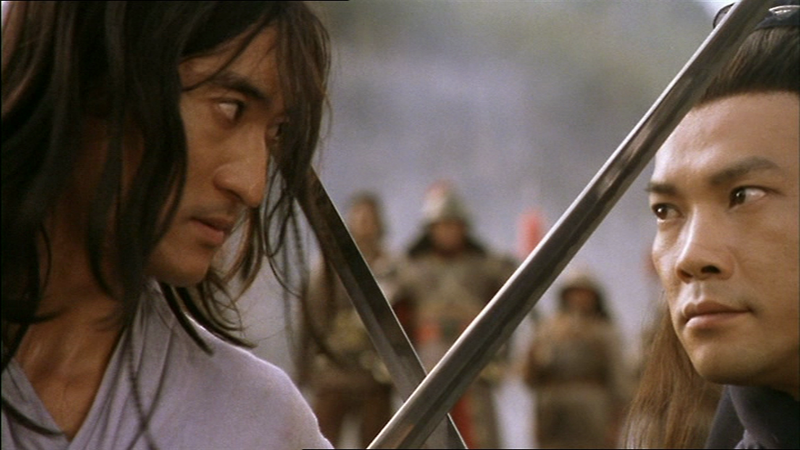 Jin-ha sets off to find Sullie and on the way is attacked by yet more assassins after his sword-fighting secrets. 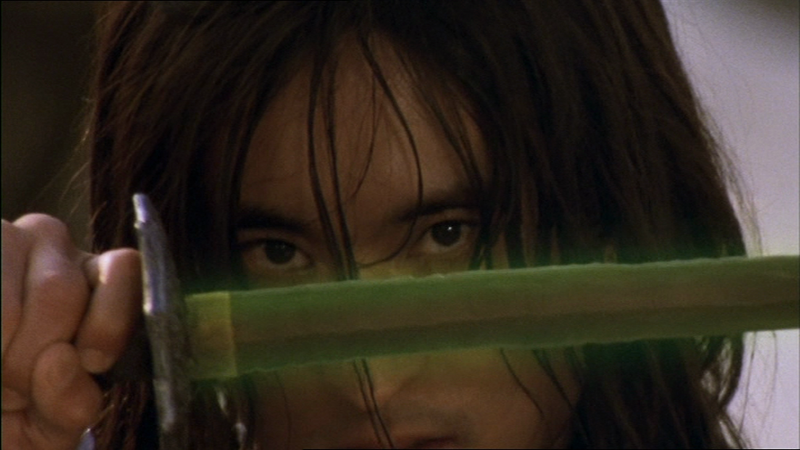 A Mongolian noble Namgung Junkwang comes to Jin-ha’s aid using a fan rather than a sword to defeat the assassins in an impressive and very fast action sequence. Meanwhile Jin-ha shows off his technique of Bi Chun Shi Gi which allows him to attack his enemies using the force of chi alone. It’s very cool. On arriving in the city, Jin-ha learns that Sullie is engaged to marry his new friend to help further her father’s political ambitions. Jin-ha attempts to run away with Sullie but the two are caught and after yet another superb fight scene Jin-ha is shot full of arrows by the treacherous General Taruga and falls off a cliff into a river. 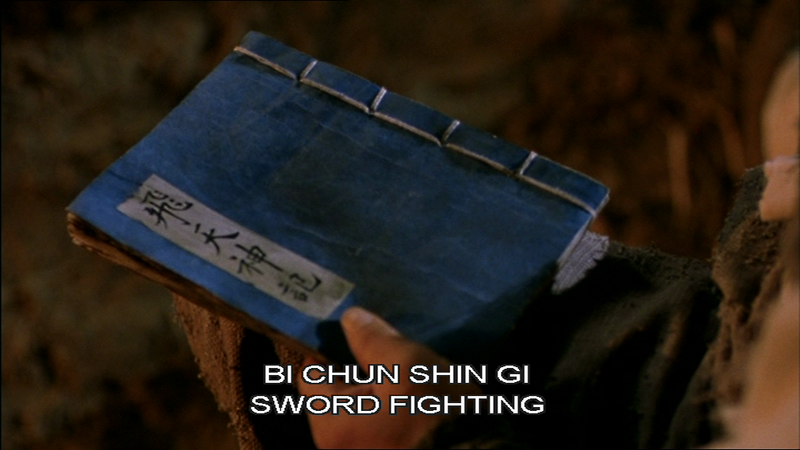 It’s interesting to note that the technique of Bi Chun Shi Gi not only allows you to explode your enemies but also has the ability to make your word glow green! Jin-ha is however rather difficult to kill – he’s not going to let a few arrows, a large fall and near drowning stop him. He is found by Ashin (Su-ro Kim) who heals him with some village remedies which seem to involve a lot of mud. At some point here we jump forward in time where Sullie believes Jin-ha is dead and is now married to Namgung Junkwang and has a 10 year old son, Namgung Sung (Bang Hyep). 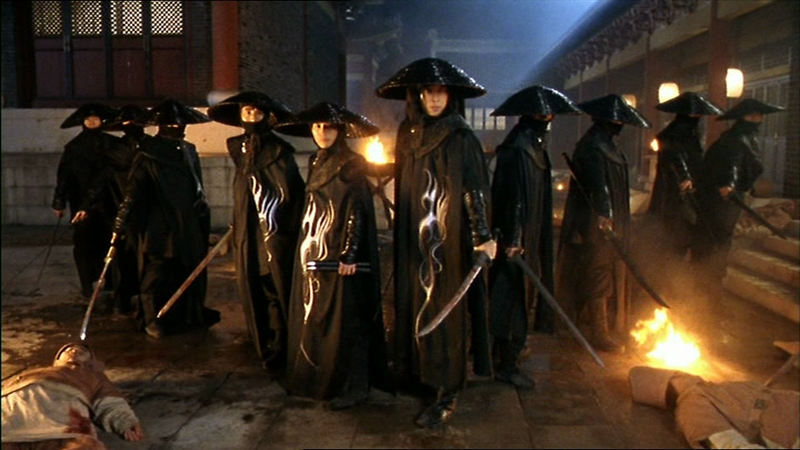 Jin-ha has become the cold and ruthless Jaha-lang and is followed by the’ Ten Black Swordsmen’ who are all trained in the art of Bi Chun Shi Gi and look like very cool Goth ninja assassins. 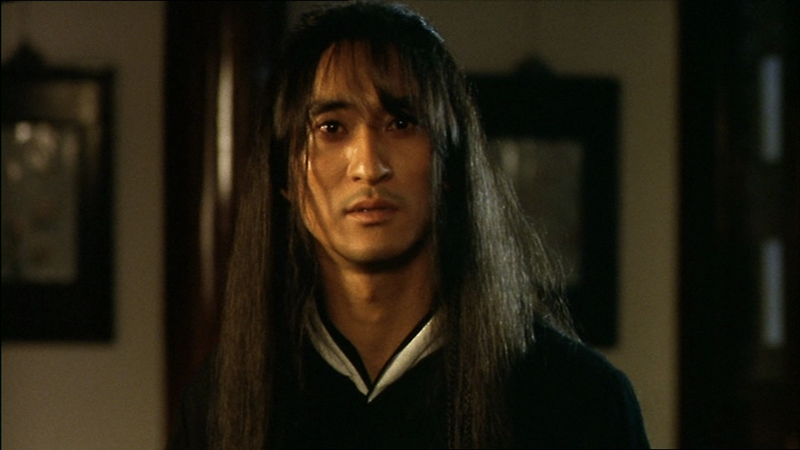 Jin-ha is aiding the rather despotic Han leader Jo-beak Seung and his evil general Saijune (Tae-hwa Seo) in their mission to kill all the Mongolians and generally mopes around trying to get over his lost love. However in the course of the Han’s campaign Sullie and Jin-ha meet again on opposing sides of the war and you just know they’re not heading for a happy ending. There is a lot more to the plot and there are betrayals, revelations, more assassination attempts and an ‘other woman’ in Lady Yeo-jin. It’s a story on an epic scale and really deserves more than 2 hours since a few scenes end up feeling rushed and there are some relationships which would have benefitted from further development. However the film looks stunning, the story does make sense despite the deleted scenes and the fight scenes are well integrated into the storyline. 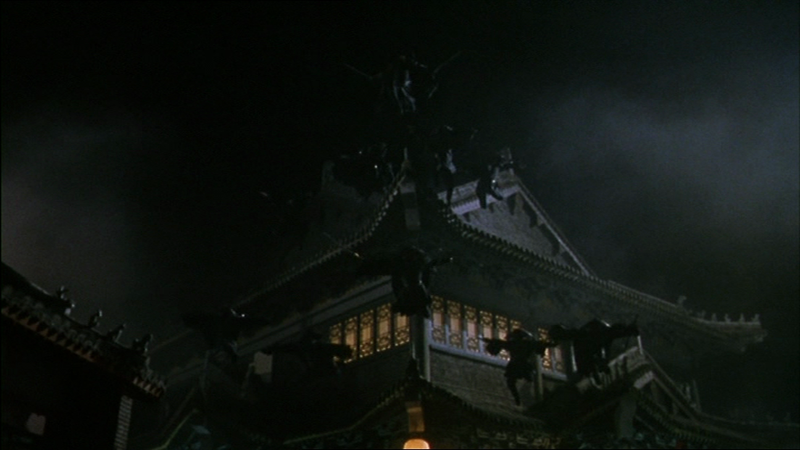 Although the actors are Korean, the film was shot in China using their more experienced crews, and it shows in the attention to detail throughout. The costumes by Min-hee Kim are wonderful and Hee-seon Kim is stunningly beautiful and ethereal as Sullie. Although her character seems quite passive, she fights back effectively against her father and is also quite capable of picking up a sword to defend herself if needed. She looks amazing here as she dances for the Han chief Jo-beak Seung and despite her rather fragile appearance she is much stronger than she looks. Hyeon-jun Shin is excellent as Jin-ha and convinces as the stoical hero. He is honest and innocent at the start of the story but changes as events turn him into a deadly fighter seeking revenge. He doesn’t let much emotion show on his face until it really counts, but his eyes speak volumes especially as he gazes at Sullie. Like all good heroes you know that his strength and loyalty will be there when needed and then he will never, ever give up. Jin-yeong Jeong is also excellent as Sullie’s husband who is also desperately in love with her but cannot ever replace Jin-ha in her heart. The other supporting characters play their parts well, and in particular Han-gari Lee is memorable as Jin-ha’s lieutenant Changryeon. The story of the tragic lovers is very over the top and melodramatic but works well as the driving force for Jin-ha’s actions and is really more convincing than relying on the revenge plot alone. The action is fast paced and frequent with fantastic fight scenes choreographed by Yuk-sing Ma. The atmospheric soundtrackby Seong-jun Kim gets replaced during the fights with electric guitars which gives a much harder edge and makes more of an impact. 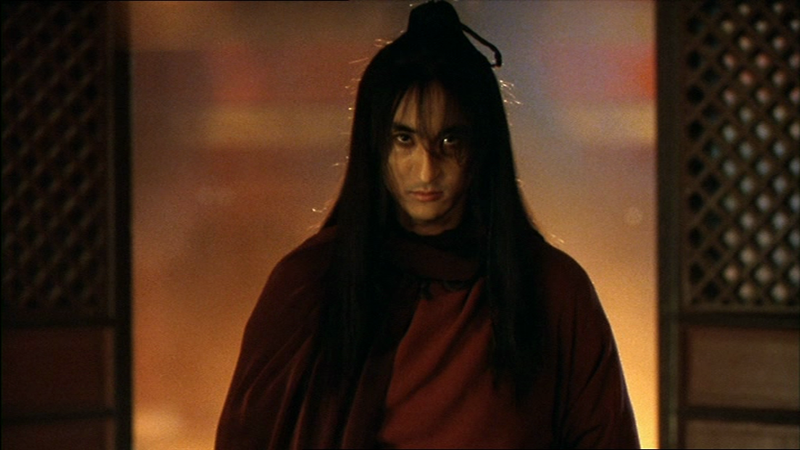 The Bi Chun Shin Gi technique allows Jin-ha to use force against his enemies and rather interestingly they burst apart in showers of dust rather than blood and gore, although there are the occasional rather anatomically unlikely spurts of blood to enjoy! It is all very spectacular and although occasionally confusing the story is compelling. It’s not a great martial arts film and although I haven’t seen the comics I’ve read that it’s not a great adaptation of these either. But it is an excellent film if you take it as a love story and just enjoy the wonderful fight scenes and glorious cinematography without worrying about the jumps in the timeline or the suddenly appearing major characters. 4 stars. This entry was posted in Rest of the World and tagged Bichunmoo, Dong-jik Jang, Hak-cheol Kim, Han-gari Lee, Hee-seon Kim, Hee-Seong Byeon, Hyeon-jun Shin, Jin-yeong Jeong, Korea, Min-Hee Kim, Namgung Sung, Seong-jun Kim, Young-jun Kim, Yu-jeong Choi, Yuk-sing Ma. Bookmark the permalink. He’s been in lots of films so you may have seen him in something else and not realised, although I think his nose is rather distinctive!